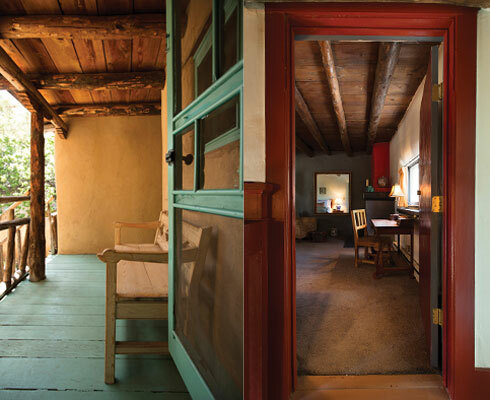 A wordsmith connects with a lifelong source of inspiration in a (sort of spooky) Santa Fe house that's loaded with literary lore. 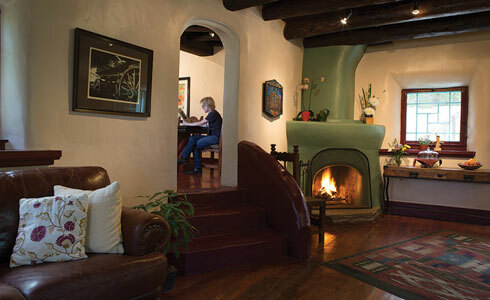 (above) These days, the Witter Bynner House is the Inn of the Turquoise Bear. In 1983, When I was 11 years old, I lived in a mysterious adobe mansion on the corner of East Buena Vista Street and Old Santa Fe Trail in downtown Santa Fe. The home, built by the turn-of-the-20th-century American poet, translator, and writer Witter Bynner, was in many ways a dilapidated wreck. Our converted apartment had ripped linoleum floors, a colony of mice, cracked walls, and non-working fireplaces. When Bynner died, he left the sprawling home to St. John’s College, and the school used it as faculty housing. My mother was hired as the assistant director of admissions, and so she, my little brother, and I moved into one of the formerly grand structure’s three down-at-the-heels apartments. Our dwelling took up roughly a third of the livable space, not counting the second story, which was cordoned off by the fire department because it was in danger of collapsing. Despite that, or perhaps because of it, my brother and I loved to play upstairs among the spooky empty rooms, which featured creaky staircases and a disabled dumbwaiter. There was no way to open the dumbwaiter, so it was easy for us to imagine that someone had been locked in and left to rot. The sequestered upstairs became a hangout that we called the Cat Club, because, well, we liked cats and you had to like cats to join. 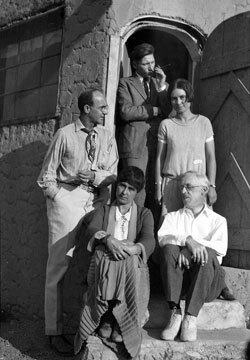 Bynner stands at left with literati Porter and Edna Foote Garnett, David Greenhood, and his wife, Helen Gentry. From the second floor’s Juliet Balcony, one could get a long look at the rambling gardens that Bynner himself had landscaped. “I work in the garden almost every day, work until I’m bruised and dizzy,” he once wrote to his dear friend Frieda Lawrence, wife of D.H. He’d planted the circular drive with lilac bushes that still took over every spring, and there were hidden benches tucked alongside overgrown walking paths, giving the impression that one could stay hidden for a long time in the labyrinth. Oftentimes, I did. Like his house, Bynner was complicated. He was tall in stature and long in good looks, his receding dark brown hair framing deep brown eyes. He was a snappy dresser and an affectionate and thoughtful correspondent who cared deeply about his friendships. But he was also a man racked with bouts of severe depression and sickness that would sideline him for periods of time, making creative work impossible. Blessedly, these phases would pass and he would find his way to poetry again. many of Bynner’s architectural touches are preserved. The same doorway used to be an exterior door. In the 1980s, at about the time I was taking my first crack at writing poetry, Santa Fe was hit with the New Age in a big way, and few of us were immune. Shirley MacLaine published Dancing in the Light, which included vignettes about her work with a local past-life regressionist and was featured in the window of Collected Works Bookstore back when it was on San Francisco Street. It’s safe to say that in those days we were all primed to receive a little something from the beyond. For my small family of three, it was a series of ghostly events at the Witter Bynner House that left us discombobulated. Whoever the spirit was, he or she had bouts of frustration or badly wanted to be noticed. During a sleepover, my friend Catherine and I witnessed a hairbrush spontaneously flying off a bureau, as if violently thrown. Another evening, my mother saw a coffee cup thrown from her bedroom bureau, causing it to shatter. Our bathroom light would go on by itself, its pull string swinging as if powerfully yanked. There were green miasmas of light that would hover near the ceiling; our cats stared up, meowing wildly. And most frightening of all, at 1 a.m.—always at the same time every night—multiple doors unlocked, one after the other, in the middle apartment, an occurrence that used to cause a St. John’s dean, a devout Catholic, to sleep with a shotgun next to his bed. There were rumors that the house was built on sacred Indian burial grounds, but I preferred to believe we lived with the unquiet spirit of Bynner himself. In 1922 he had his first encounter with the Lawrences, who arrived by train in Santa Fe but were too tired from their journey to tackle the next leg to Taos. 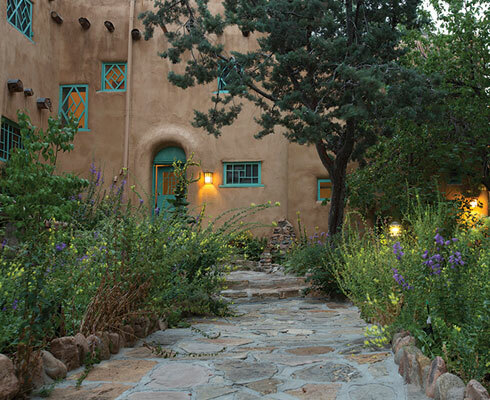 Bynner’s friend Mabel Dodge Luhan, who was picking them up, asked him if they might spend the night at his house. He opened his home to them, and was enchanted by both. “It was as if she [Frieda] were the earth, and he the house. The house of course gets the notice.” His friendship with Frieda lasted a lifetime; his with D.H. was an important one as well, but was also tempestuous. “This man whom a generation is thinking is intellectual is as set about with superstitions as a parlor of palmistry,” Bynner wrote in a particularly irritable letter to a friend. In some ways, Witter Bynner and I have lived lives in reverse. He was born in Brooklyn and spent his youth on the East Coast and his mature years in Santa Fe. I was raised in Santa Fe and spent my adult life on the East Coast. I’ve always thought we shared a passion for words that bridged our disparate decades and the spirit ether. The Juliet balcony, a childhood haunt of the author’s, now affords guests staying in the Witter Bynner Room a lofty view of downtown Santa Fe. Living in the house shaped my world and literary views. Growing up, I had the good fortune of being lulled to sleep by the sound of a humming blue Smith Corona typewriter on which my mother churned out young-adult novels for Scholastic Books, year after year. I knew that the craft was written into my destiny from the time I was in the fourth grade, and my crush Zachary drew a picture of me behind a typewriter, which said simply, “You in 20 years.” As with every other female author I know of my generation, Harriet the Spy was a major influence, and from the doors of the Witter Bynner House I would emerge with a notebook and pencil in hand, ready to stroll aimlessly, eavesdrop, and take random notes about passersby. Or I sat in the Cat Club on the second floor, reading Jane Eyre or Little Women, imagining myself to be like Jo March, who sat in her attic, reading and eating apples. I have always been receptive to the coincidences that connect us. Bynner spent his early post-collegiate years in New York working for magazines, and so did I. He became a sturdy champion of a slew of young poets, and I’ve found great joy teaching writing at the New School for over a decade. He held literary salons, and in a way, I did too, tucking into the now-shuttered Peacock Cafe, on Greenwich Avenue, with a small writers’ group. Recently, I glanced up in the poetry section of the Strand Bookstore in downtown Manhattan to see an intact three-volume collection of Bynner’s works. I sprung for it, and have it in a place of honor on the shelves of my tiny New York living room, where regular sightings of it fill me with a sense of home. The west side of the house today. 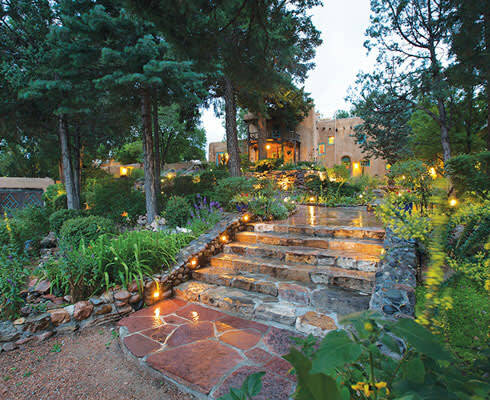 Several years ago, the house, with its luxurious circular driveway and lush gardens, became a bed-and-breakfast called the Inn of the Turquoise Bear. Its bedrooms were named after the luminaries Bynner hosted, corresponded with, and championed. The names of Willa Cather, D.H. Lawrence, Igor Stravinsky, and Edna St. Vincent Millay are uttered frequently in academic and cultural settings. But on East Buena Vista Street, they are spoken every day in the warmth of convivial living spaces, as they were in Bynner’s time—before friends became legends. Rachel Aydt is a writer who lives and works in New York City.